After an initially negative reaction to earnings after the close yesterday, shares of Facebook (FB) staged a sharp rebound overnight and into today and are currently up by over 5%. With that gain, Facebook’s market cap exceeded $500 billion for the first time, joining the narrow ranks of Apple (AAPL), Alphabet (GOOGL), Microsoft (MSFT), and Amazon.com (AMZN). At one point this morning, it looked as though FB would overtake AMZN for the number four spot, but AMZN’s rally today has been enough to hold FB at bay (for now). 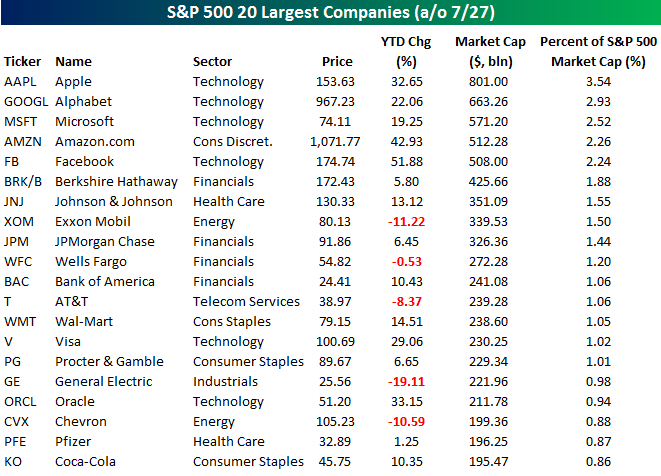 The table below lists the 20 largest companies in the S&P 500 based on market cap, and as you can plainly see, tech dominates the top of the list with the three largest companies and four of the top five. The only non-tech stock listed is AMZN, and one could easily make the case that it is just as “techy” as any of the other names. What’s really fascinating about the market caps of these top companies is that the four largest stocks in the S&P 500 Technology sector now account for 48% of the sector’s total market cap and 11% of the entire S&P 500. Looking at it from the other side of the market cap spectrum, the 50 smallest companies in the S&P 500 account for less than 1.5% of the index’s total market cap while the smallest 200 companies account for less than 10% of the index’s market cap. Think about that for a second. If the smallest 200 companies in the S&P 500 were to drop to zero overnight, we still wouldn’t get a 10% correction in the S&P 500! While there has been a lot of talk about the fact that the S&P 500 has become so top heavy and the risks it poses, by itself it isn’t a problem. As long as the rest of the index continues to hang in there, it is not a problem. The time to be concerned would be if we ran into a situation like 1999/2000 when the top stocks were rallying but the rest of the market was faltering. The best way to track that is by monitoring overall breadth levels, and looking at those, we are from that point.